The politics of body size has been the topic of intriguing feminist work. Although in my view this issue is still undertheorized, I have long sought for a way to bring what does exist in the literature into my academic activities. 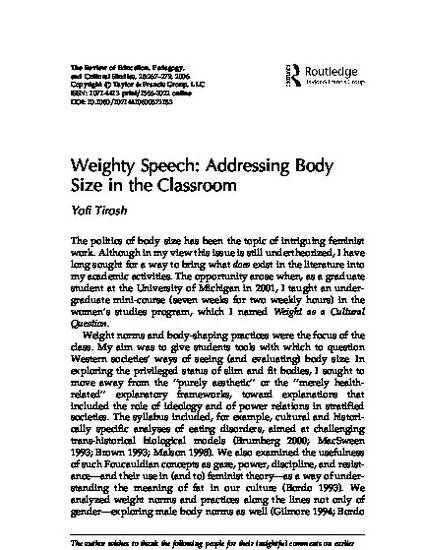 The opportunity arose when, as a graduate student at the University of Michigan in 2001, I taught an undergraduate mini-course in the women's studies program, which I named Weight as a Cultural Question. This essay discusses two pedagogical challenges I faced while teaching a class. Both questions deal with the extent to which it is productive to talk about one's own body in a class setting. One question concerns my search for ways to achieve a safe and enabling classroom environment - a space in which my students and I could comfortably discuss such a sensitive issue as body size. As I explain below, one of the ground rules for class discussion was that participants refrain from directly talking about their own body size or that of their classmates. At the time, this rule grew simply out of strong intuition. Here I attempt to work through the seeming contradiction between this rule and my main goals in this class: how to understand my impulse to silence any speech about the bodies present in the classroom in a course aimed at putting the body back in the center of political consciousness and cultural analysis? In trying to trace the reasons for this rule, I consider its function in curbing our tendency to turn to language as a medium through which to relate to our bodies. I contemplate the role of silence in enabling a less mediated access to the body. The second question involves my own body as the body of the instructor of this class. In a class that seeks to politicize cultural perceptions of body weight, the instructor's own weight is inevitably present: it speaks. I had to face the fact that my body size had expressive force whether I liked it or not. I ask, therefore, what work did my size and shape do in relations to authority, credibility, and aspiration to teach from experience? Finally, these two questions - that of not talking about the body in class and that of the expressive force of my own body - intersect in a current dilemma I have as an assistant professor of law, concerning whether to provide an account to my students about the reasons for my noticeable weight changes.